Our goal is to develop well-rounded academically-strong, curious, courteous, courageous learners ready for success in high school and life. We strive to develop all aspects of a child in preparation for college, or entrepreneurial/ professional life. respectful of religious orientations, with a strong honor/behavior code, high academic standards, and a commitment to developing all aspects of a child. It is best explained by our shield. Just click on the shield for more information! We have an upbeat fun culture that supports learning but also relies heavily on our value statement and honor codes to provide that supportive environment. For more on this, click on the pledge picture. We take a positive strengths based stance on education that supports providing students with tools to use in academics and in their broader lives. 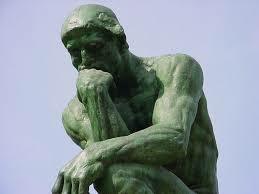 Click on the picture of Rodin's Thinker to visit our philosophy of education.